Carolyn, 15, and Tara, 11, Nicholson lost their mother, Colleen, on Oct. 4. In the wake of this tragic event, both girls have been the pillars of courage en route to their sports teams capturing diocesan championships. 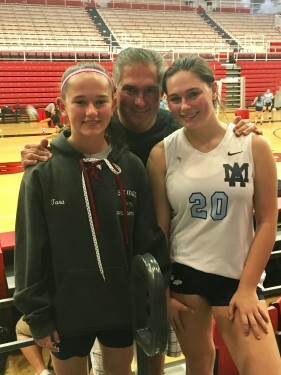 Carolyn was the captain of the Archbishop Molloy H.S., Briarwood, junior varsity girls’ volleyball team that completed an undefeated 23-0 season. The team captured the GCHSAA Division I diocesan title en route to a victory in the ‘AA’ city championship. Tara’s seventh-grade Catholic Youth Organization rookie girls’ soccer team from St. Mel’s parish, Flushing, also had an undefeated season and won its second consecutive diocesan championship, both in undefeated fashion. Tara had the game-winning assist as her free kick set up teammate Mia Ferrara for the only goal in a 1-0 win over Blessed Trinity, Breezy Point. In both instances, Colleen was watching over her daughters. The St. Mel’s team dedicated their season to Colleen, who was a fixture at every game and an integral part of the Wildcats family. The players wore special patches on their uniform in memory of Colleen. “We received overwhelming support from the St. Mel’s community,” said Brian Nicholson, Colleen’s husband and an FDNY lieutenant. Sports are often said to have healing powers during tragic events, and no better example can be seen than the strength displayed by the Nicholson family – especially these two sisters – during this fall sports season. Allan Fernandez, a senior center back on the Cristo Rey Brooklyn H.S., Flatbush, varsity boys’ soccer team, represented his school and the CHSAA Nov. 20 in the New York City Mayor’s Cup game played at St. John’s University, Jamaica. Fernandez, who started at right back and was named a team captain, became the first player in Cristo Rey Brooklyn history to represent the program in this game. The CHSAA defeated the PSAL, 2-0. 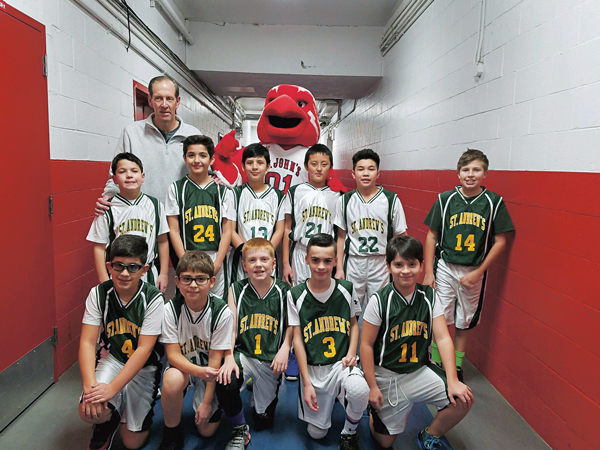 The St. Andrew Avellino, Flushing, Catholic Youth Organization bantam boys’ basketball team, coached by Phil McBride, played at halftime Dec. 5 at Carnesecca Arena in Jamaica during the college hoops game between St. John’s University and Cal State University, Bakersfield, Calif.